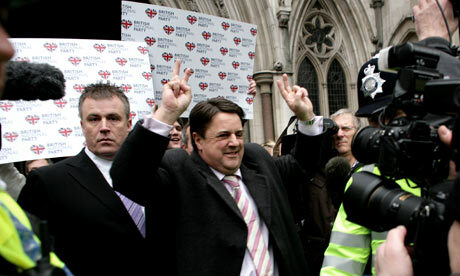 BNP leader Nick Griffin. His party has developed one of the most popular political websites in the UK. When I began studying extremism almost 10 years ago, the main sources of information were interviews with activists, party newspapers and magazines, and the occasional meeting. Today, almost everything you need to know about the far right is online. In fact, its activists have embraced the internet to such an extent that it’s now virtually impossible to track all the bloggers, Twitter accounts and Facebook pages that have, for them, become indispensable tools of communication. For optimists, the arrival of internet technology and social networking signalled an opportunity to counter the right’s extremist politics: an arena through which the bonds that bridge communities opposed to rightwing doctrine could be strengthened. But, for pessimists, this change was only ever going to strengthen extremist groups and their supporters, by forging links between members of a closed and stigmatised community, strengthening their collective identity. The digital age is changing the modern far right and how we make sense of it in four main ways. First, it has facilitated the quest for credibility. Social media tools have enabled fringe groups once derided for having “more initials than members” to cultivate an image of power and influence. The British National party was one of the first far right groups in Britain to realise the internet’s potential. Initially, it simply replicated the website of a more successful French far right party but, before long, it had built one of the most dynamic, interactive and popular websites in British politics. Even though the party is now dismissed as a failure, it has retained almost 85,000 Facebook likes. This almost matches the Liberal Democrats, is nine times higher than Ukip’s Facebook following, and five times higher than the Greens. An entry for the English Defence League – formed only in 2009 – has attracted more than 15,000 likes, while dozens of affiliated pages (Hindus who support the EDL) have up to 5,000 followers. Not all are sympathisers, but a significant portion are. Second, it has helped the far right sustain the loyalty of followers and cultivate a strong collective identity. Its virtual communities have become essential to understanding how these groups pull rather than push citizens into their world. One example is a study of Stormfront, an influential site that has a global reach and is a key rallying point for neo-Nazis. One activist described the forum as “like a second home”. Importantly, while most of these followers were ridiculed in the public sphere, this virtual community offered them a set of shared values, norms, meanings, and a sense of history. At times this was expressed through seemingly insignificant gestures – such as wishing each other a happy birthday – but it offered something entirely absent in the offline world: solidarity, comradeship and, above all, acceptance. As sites such as Stormfront demonstrate, the far right is not simply about winning elections; it also strengthens and passes a particular belief system and collective identity on to future generations. Third, the internet supports new forms of far right mobilisation. Perhaps the most significant is the Immortal group in Germany, which emerged in 2011. Organised around Twitter and other social media, it stages unregistered rallies at night, at which its activists wear white masks, carry torches through urban areas and chant extremist slogans. Shortly after each gathering, a professionally produced video appears on YouTube. Intended to demonstrate the group’s power and support, the imagery harks back to the torchlight processions of inter-war Nazism. Another example is how the “counter-jihad” networks in North America and Europe increasingly rely on social media to organise international demonstrations and meetings (one was held in Stockholm last weekend). As happened when websites first developed, the far right is again proving to be more innovative than established political groups at harnessing the power of the digital age. More recently, supporters of the EDL launched a Twitter campaign against me claiming that I have never interviewed anyone on the far right and that my research is restricted to the world of social media. The fact that I’ve undertaken well over 70 interviews with members of various groups is ignored; nonetheless, within minutes, a blog had been posted on a forum for “peaceful hooligans” and so the campaign trundled on. As Gary Younge pointed out last month, the internet has not created these reactions but it has exacerbated them. The anonymity it offers makes activists feel more empowered. Social media tools have encouraged far right activists to become far more combative and – persistently – attempt to insult individuals and discredit their research. While bringing opportunities, the digital age has also brought fresh challenges. In circumventing traditional channels of communication, it seems that we are only at the very beginning of a much broader shift in terms of how far right groups are rallying support. Mainstream parties and other groups will have to be on their guard to ensure their messages of hate do not take hold. From The Guardian . 07.08.12. Article by Matthew Goodwin, School of Politics and International Relations at the University of Nottingham.